My pond is dry, but it's not dead. It's just resting ... in a dry sort of way. Below is a recent view looking south. The little dock is off to the right and is a good reference point for comparison of the water level in previous pond posts. I spent the last hour of sunlight Sunday evening shoveling some of the drier black organic goo up on to the high pond banks. Beneath a few inches of goo is clean white sand. The wetter black goo has the consistency of pudding and is quite the quagmire. The heron below loves the low water. The shallow conditions concentrate his little targets so hunting becomes ... like shooting fish in a barrel. He actually was gulping something sizeable as I walked up. It's almost gone in the picture. The view below is looking north and I am down in the pond. I would have been underwater at this point a year ago. The dock is to the left, just out of the picture. I used to stand on the dock and watch the catfish and bream swim over the top of the dead, prone willow lying in the pond. 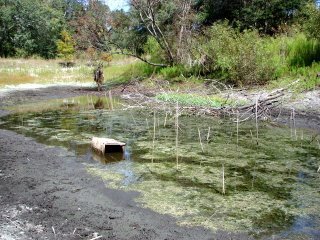 The produce crate was placed in the pond as a potential catfish nest. The dragonflies below are feeling the tug of the seasonal change. 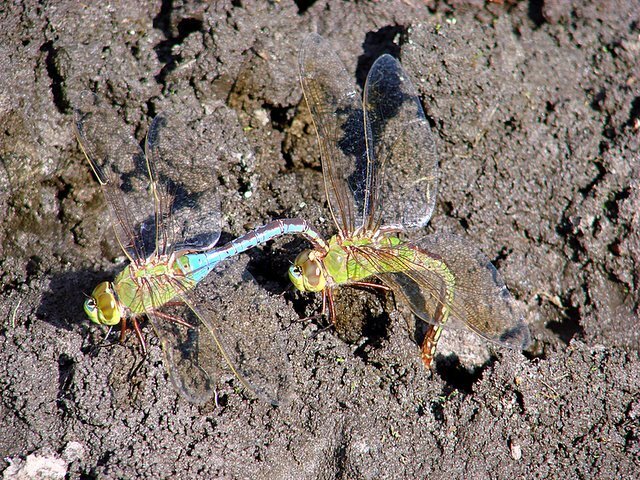 They were busy depositing eggs in the exposed pond goo to ensure next year's crop of mosquito hawks. With our dry summer, mosquitoes were almost nonexistent in Pure Florida this year. The tiny puddle of water that remains still teams with minnows, tiny bream, snails, and water bugs gambling on some good rainfall. The odds are against them as we enter our dry fall season, but they persist. 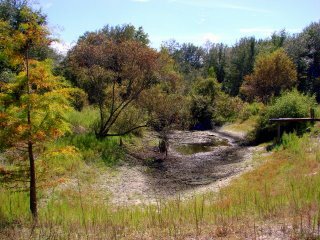 So, the pond is dry, dehydrated, dessicated, desertified, ... call it what you will, but it's far from dead. Perhaps we can send you some water. There are still pools left from the nor'easter we had a little over a week ago. And I can help you out with that mosquito shortage...we are having one of our worst seasons ever for the little blood suckers. It is sad that your pond is dried up. Does this happen regularly or is this a first time happening? I recall here in Florida where a sink hole swalloed a whole lake. I like the way you put that, "it's just resting". Nature seldom makes mistakes and this dry time probably benefits some sort of creatures, like the heron and possibly the wood storks too. That lack of mosquitoes sure has been a blessing this year!! I believe I have only been bitten about 6 or 7 times this year...not bad for someone who spends so much time on the water :-D And I loved that heron picture...he sure is pretty. Doubleknot asked the question I was going to ask-- Is this a regular occurrence? Has the pond ever been this dry before? 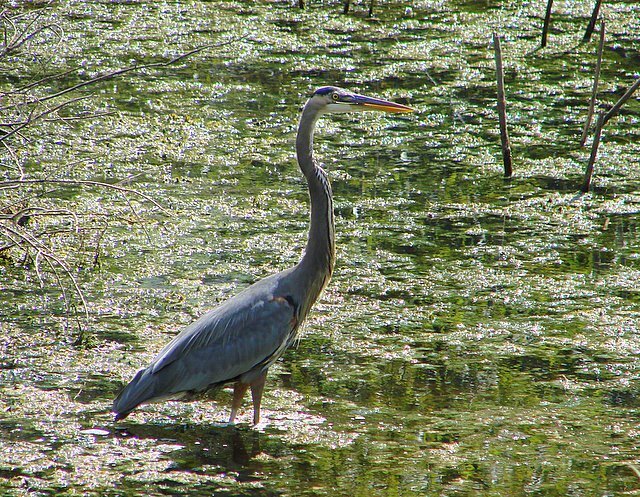 Really nice heron pic, FC. I checked our pond the other day, and we still have some good-sized goldfish left. The heron didn't make off with all of them, yet. The dark fish are gone, but I saw two or three gold. Survivors. We got a nice bit of rain over the past couple days, so maybe it'll head your way next. It was nice while it lasted, but it turned hot and muggy again afterward. The dearth of mosquitoes has been a tremendous blessing here in the forest. We have a sinkhole in the back 40 that used to be a cattle watering hole. They grow nigh onto Glades size back there. Your dragonflies don't look like our local variety at all. I had no idea. We have received about 4 inches of rain over the past two days, and it has helped recharge our ponds. I have been trying to coax the storms over your way after they pass here, but I guess they're not being too cooperative. There has been an absence of mosquitoes in Minnesota as well, and I've enjoyed it! A lot of ponds around here are low, but our swimming pond apparently is dug deep enough to withstand a drought; the deepest part was still about a foot over my head the last time I swam. Sending some good, rainy thoughts to you and Pablo! The pond isn't sleeping... it's just resting its eyes. Do ponds have eyes? Hrm. I'm sure our turn for both rain and mosquitoes will come again. It's been a while, but it does happen every couple of years or so. You got it. It may be rough on a fish watcher like me, but in the big picture, it's good for the pond. Thanks. I'm glad the mosquito shortage extends to you. It does dry up occasionally. That's strange that your dark gold fish got et first. I would have thought the gold ones would be easy targets. That's good news. Muggy was the word today. Whew! A wall of warm steam met me at the door this morning. Funny. 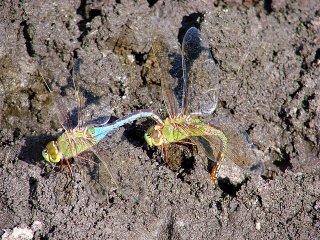 One thing I've learned from all these nature blogger sites is the amazing variety of dragonflies. They're easy to photo and show up on a lot of blogs. It's probably the roundrock interference zone. Well, I'm glad someone has water in their pond. I soooo almost used that line. I know, it's tough on me too when I think of my catfish feeding walks of early last summer. What a great post. That's it. Just great. Thanks. We had so much rain this year that I noticed a neighbor has had a pond in his front yard not of his choosing. It's too bad that your pond is almost dry...Maybe the winter months or the spring rains will be kind to your pond. I saw an egret today along a roadside creek.